Last school year, only a few weeks after Oliver was diagnosed with dyslexia, Bennett's kindergarten teacher sat down with me. She wanted to tell me she was suspicious that Bennett might have dyslexia and had no idea, at the time, that his brother had just been diagnosed. She knew only that Bennett was very smart and wasn't performing in reading and spelling as she believed he should. She encouraged me to have him evaluated. 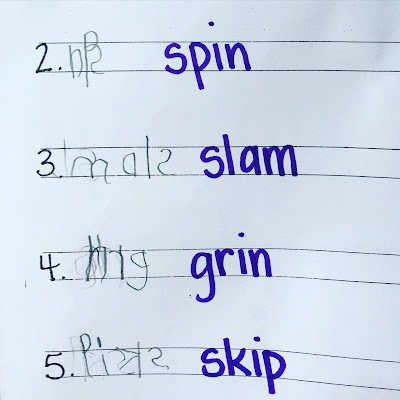 This is a sample of Bennett's school work that was concerning to Bennett's kindergarten teacher, prompting her to suggest he be tested for dyslexia. So this September, now with Bennett in 1st grade, six months after I took Oliver to UNT-Denton to get tested, I took Bennett for his own psycho-educational assessment. A few weeks later, he was given the official diagnosis of dyslexia, a neurological condition that involves difficulty in learning to read or interpret words, letters and other symbols but that does affect general intelligence. In the same way I have become an advocate in the area of CF, I have spent many many hours to become to advocate for my boys in the area of dyslexia. I have scoured the internet. I have ordered books about dyslexia on Amazon. I have found friends going through the same journey. I have joined dyslexia Facebook groups. For months, I sucked down every piece of knowledge I could gain about the topic of neurodiversity and dyslexia, all so I could begin to articulate what my boys were dealing with and to decide how to help them. 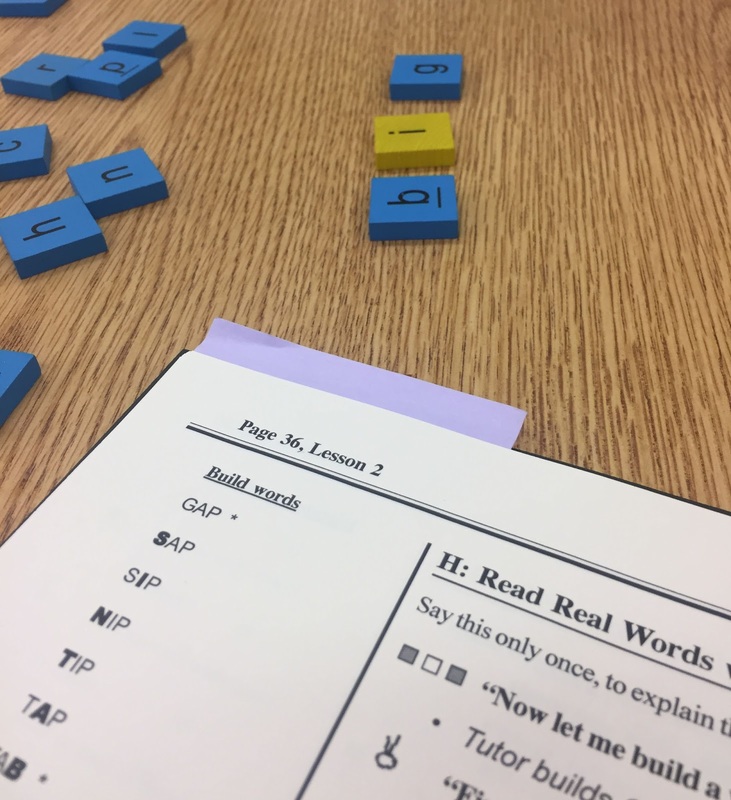 Almost as soon as one gets the dyslexia diagnosis, one learns about the best practice of receiving Orton-Gillingham based one-on-one 2X per week dyslexia tutoring. Thankfully, by the time we received a diagnosis for Bennett, Oliver was already working with a dyslexia tutor. So, it was easy to just plug him in. But, over time, I began to realize the cost and commitment of having two boys in twice weekly tutoring for years to come - and I began to recognize that maybe it would be easier if I became a dyslexia tutor myself. Thankfully, since I have a Master in Education, doing so wasn't too difficult. I found a highly-recommended reasonably priced curriculum that I could use without significant training. The dyslexia curriculum I use is called "Barton Reading and Spelling Systems." 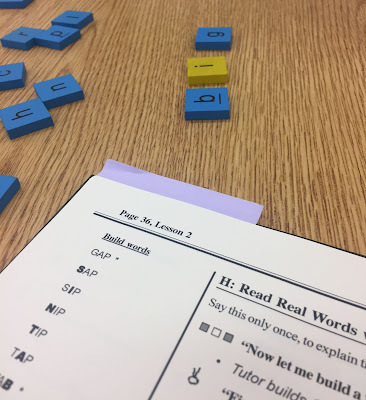 The program helps break down/isolate the phoneme sounds and provides spelling strategies and spelling rules to help people with dyslexia master areas that are often challenging. 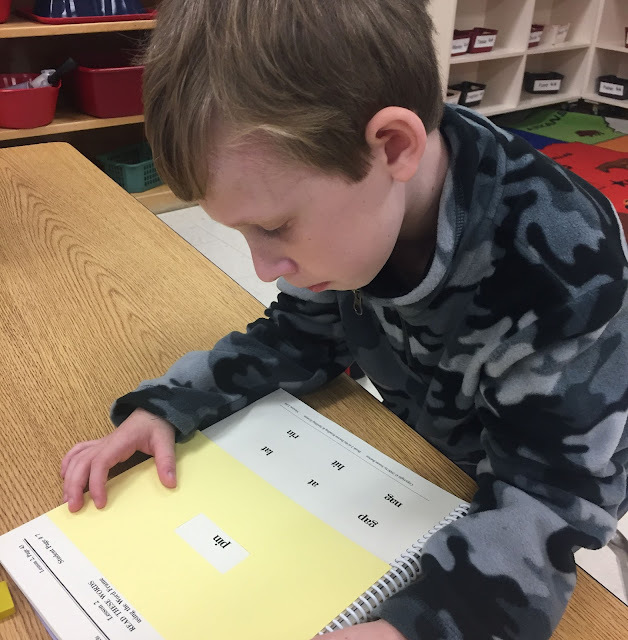 In addition, it offers significant opportunities to practice these strategies which is imperative for those with dyslexia. Reading and spelling issues with dyslexia can be directly addressed through tutoring but dyslexia affects other aspects of school learning, including memorizing and processing. It is complicated enough in the classroom to deal with cystic fibrosis, but it's even more complicated when a learning disability is involved as well. But dyslexia, just like CF, teaches me to be patient, to see the child beyond the diagnosis and to embrace a different experience than we first expected to have. One of the biggest reminders CF provides our family is that we're not in control...and that even, if we do everything "right", it still might not turn out like we want. So we've learned that it's better to live in the present, not stressing about the other things, but embracing these things. Bennett missed a lot of school last year and continues to miss school due to his CF. Even if we can get Bennett better where he needs to be educationally, there is a very good chance Bennett will land in the hospital at some point and likely he'll fall behind again. Then what? Our family just can't play that game. Throughout much conversation, Brian and I spent time recently reminding ourselves what is true about Bennett and our role as his parents: Bennett is a very intelligent, tender-hearted and eager little boy who will thrive in whatever situation he is put in. We realized that what we, as his parents, need to do for him - more than anything else - is to just stop the noise around him - to prevent pressures that might make him feel like he's missing out in life and to help him to fully engage in whatever life has given him in the moment. Brian's and my hopes for Bennett are no less high as they were before we got the CF diagnosis...and the dyslexia diagnosis. They are just different. And there is something beautiful about our hopes being different - because it is at that point that they've stop being our hopes for Bennett and, instead, have become Bennett's hopes for himself. Progressive diseases don't give the gift of time. But they do give the gift of the present. Learning disabilities don't make things easy. But they remind us our value doesn't come from others. Bennett's challenges bring up compassion within me. I want nothing more than for life to be easier for him. But it is in light of these challenges that Bennett most demonstrates the depth of his strength and resilience. And I am incredibly fortunate, as his mother, to get a chance to experience this part of him first hand. I'm proud of you, Bennett. I'm proud of you too Bennett! I'm also proud of your mother and Dad. I can tell you're smart when I talk to you Bennett, so never let anyone tell you you're not. The same goes for you Oliver. Both smart kids! 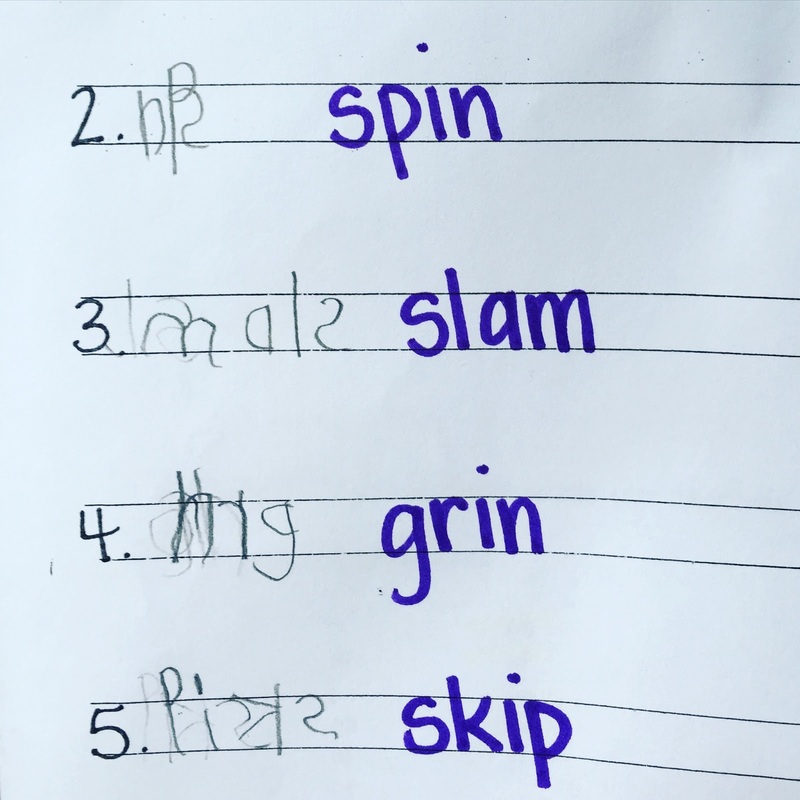 Before you spend a lot of time tutoring, you should see if the boys have strong phonemic awareness skills. Can they segment sounds in words? Can they rhyme? If they can't, all the tutoring in the world is not going to help, because phonemic awareness is a prerequisite to learning to read. I work at a school for kids with learning disabilities, so if you want any advice let me know!